Thousands of people are expected to watch the 1,000 strong flotillas along the Thames in London today as part of the Queen's Diamond Jubilee celebrations, marking 60 years of her reign. Street parties and various events are taking place up and down the country over the long Jubilee Bank Holiday weekend. 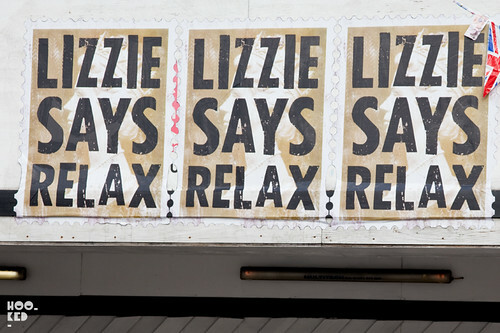 In the lead up to today's celebrations a number of London street artists have been putting up there Jubilee inspired street art around East and North London. 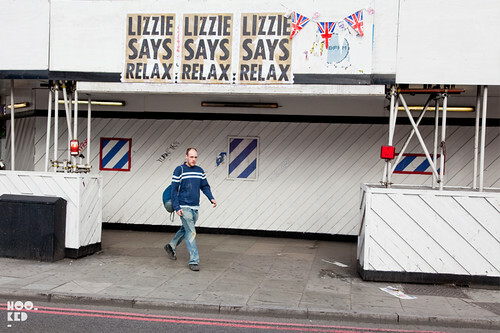 Dr.D has hit the old street roundabout and Aldgate East tube (pictured) with his Lizzie Says Relax message overprinted on super-sized stamps featuring the Queen's head with Union Jack bunting finished off with £20 and £50 notes attached! 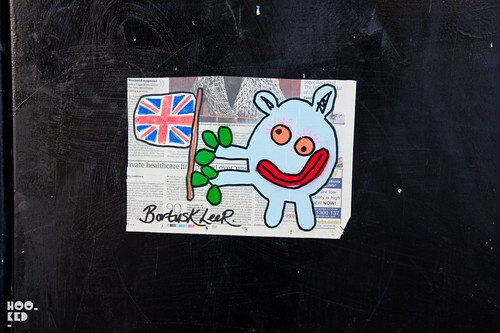 Bortusk Leer has also been hitting the streets with some new paste-ups, unleashing a new series of his deranged looking monsters around Brick Lane and Shoreditch complete with Union Jack hats, flags, and some festive ice cream and beers. We have also seen a piece from stencil artist Banksy on Whymark Avenue in Turnpike Lane. 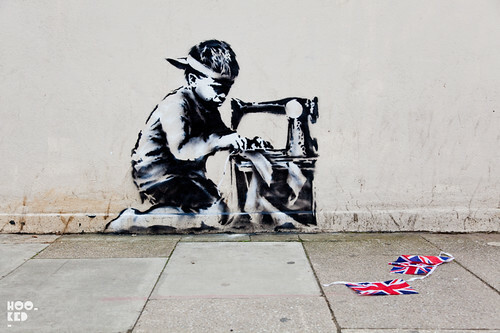 His Jubilee stencil piece featuring a small child at a sewing machine with Union Jack bunting appeared in North London earlier last month. The original bunting was removed/ stolen and then replaced again as people wanted their shot of the piece with bunting attached. We have previously posted a collection of images of this Banksy street art piece on Hookedblog before it went under a sheet of protective perspex complete with bunting! 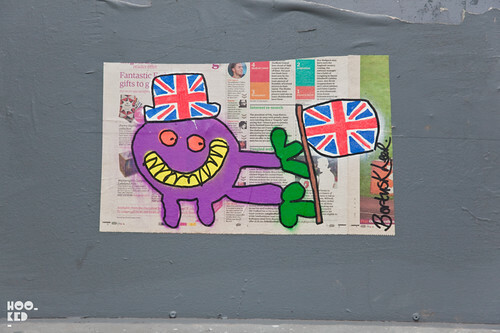 You can see our series of Banksy Diamond Jubilee images here. 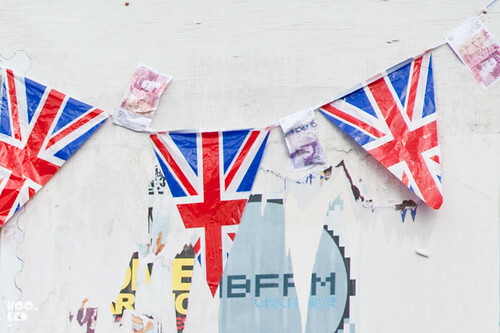 Should you wish to join in and get festive there is a free Banksy Diamond Jubilee flag image which you can download exclusively from Pictures On Walls website. 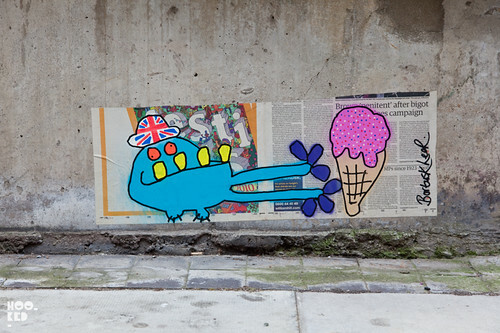 Happy Jubilee everyone and should you see any other Jubilee inspired street art feel free to tweet us @Hookedblog the pictures. 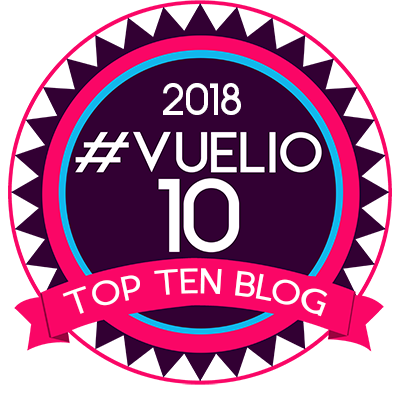 ok, maybe the banksy content led me here, but i do like this blog.